In this chapter, we present a protocol to perform correlative light and electron microscopy (CLEM) on Caenorhabditis elegans embryos. We use a specific fixation method which preserves both the GFP fluorescence and the structural integrity of the samples. Thin sections are first analyzed by light microscopy to detect GFP-tagged proteins, then by transmission electron microscopy (TEM) to characterize the ultrastructural anatomy of cells. The superimposition of light and electron images allows to determine the subcellular localization of the fluorescent protein. 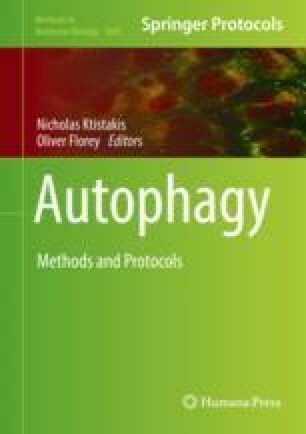 We have used this method to characterize the roles of autophagy in the phagocytosis of apoptotic cells in C. elegans embryos. We analyzed in apoptotic cell and phagocytic cell the localization of the two homologs of LC3/GABARAP proteins, namely, LGG-1 and LGG-2. The authors would like to thank the C. elegans community and the Caenorhabditis Genetics Center which is funded by the NIH National Center for Research Resources (NCRR) for C. elegans strains. We are grateful to Claire Boulogne for critical reading of the manuscript and helpful discussions. The present work has benefited from the expertise of Béatrice Satiat-Jeunemaitre, Cynthia Gillet, Jessica Marion and Claire Boulogne and the core facilities of Imagerie-Gif (http://www.i2bc.paris-saclay.fr) member of IBiSA (http://www.ibisa.net), supported by “France-BioImaging” (ANR-10-INBS-04-01), and the Labex “Saclay Plant Science” (ANR-11-IDEX-0003-02). This work was supported by the Agence Nationale de la Recherche (project EAT, ANR-12-BSV2-018) and the Association pour la Recherche contre le Cancer (SFI20111203826).